Living in a van/traveling full time, though it’s becoming more common, is still a 180 degree turn from the way we are conditioned to live. As we prepare to leave, we understandably get a lot of questions about this. The most frequently asked are: where are we going to first? There is no good answer to this question, but in all honesty, probably Target...because we always forget something! There will be more on that subject at a later date. The other question is, how did we decide that we wanted to live in a van and be mobile full time? The answer to this question starts a ways back. Owen and I have always been extremely keen on adventure. Every weekend we would push our way out of town to find something new that we had never seen, hiked or climbed. The southeast US is a beautiful place, we made it our mission to experience as much of it as we could at every available moment. After graduating from college, it was the first chance we had to really devote some time to expanding our horizons to the rest of the country. With that in mind, we decided to travel the country on our savings until they ran out. 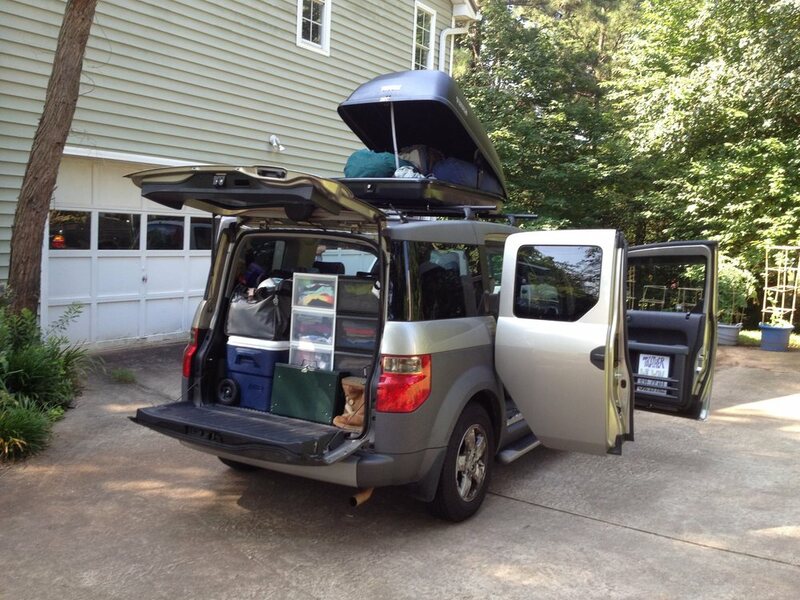 That plan resulted in a Honda Element, 5 months, 14,000 miles, 3 distilleries, 21 National Parks, 6 breweries, and 11 audiobooks. Owen was making it out of the southeast for the first time, but together we were learning how much our country has to offer. Trips inherently have an end to them. When we ran out of money we found our way back to Atlanta. We both worked our way back into the working world, but it always felt like we were missing something. Being on the road was always in the back of our minds. We missed everyday being filled with beauty and inspiration. We spent our days doing only what we really wanted, and cut out the rest. It was so hard to go back to just experiencing that on the weekends. One day in early 2014, one of us mentioned out of nowhere “Why are we not on the road anymore?” It was at that moment we realized that there was not a single day that had gone by that we didn’t think about how at home we felt on the road. Then I said “Let’s go on the road and stay there.” We sat down and scoured the internet for how to do it the “right way” this time (aka sustainable). From that night forward we would be back on the road in April of 2016. Two years, a van purchase, a marriage, countless hours of work on the van, 2 quit jobs, 2 new freelance careers, tons of tiny test trips, and a boat load of research later, we are just a month and a half from our departure. We are so excited to be living on the road again where our days will be boiled down to the bare necessities. We can explore with unwavering curiosity and enthusiasm all while creating work that we are truly proud of, for clients that we genuinely care about. All while being surrounded by the things and places that inspire us most. Life is just too short and there is too much to see. In the weeks to come we are looking forward to going into more detail about the preparations, sacrifices, and work that has gone into getting us to the road. It has been a long and complicated journey but we are so excited to share it. All in hopes of inspiring others to live the life (regardless if it in is a van or not) that they feel they are meant to lead, and to see the value in getting to know the world around you.